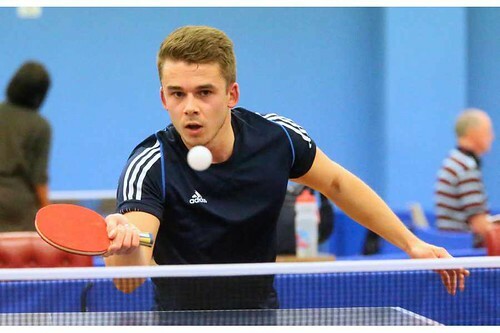 The 2015/16 Island table tennis championships kicked off on Friday evening with 3 events being contested. The Championships have historically been held at the end of the season in April/May, however the Association is this year experimenting with an earlier Championships. This event is designed for players that are between the ages of 21 and 40 and that have not competed in the Inter-Insular 'Green Trophy' event against Jersey for the previous 2 seasons. Olly Langlois (Pictured), a former Green player himself has returned to the sport this season and as top seed for the event, he cruised to the final with straight game wins over Jamie Ferbrache and Paula Le Ber. He will meet Liam Robilliard in the final after he defeated the defending champion and 2nd seed Paul Hainsworth 4-1 in the semi finals. This well supported event for players over the age of 40 saw a total of 23 players competing for a spot in the final next Saturday evening. Top seed Phil Ogier was in complete cruise control on his way to the final and he overcame Martin Sarre 4-0 in the Quarter Finals and Jez Powell by the same score in the semis. 2nd seed Dawn Morgan also made her way to the final as expected and was a straight game winner over 7th seed Tim Le Page in the Quarter finals. She dropped the 3rd end of her semi final encounter with 5th seed Phil Hunkin but was too consistent and won over 5 games. Another event to follow the seedings was the Under 21 Open Singles where the top 4 seeds all made their way to the semi final stages. Top seed Joshua Butler was up against 3rd seed Lawrence Stacey and he duly made his way to the final after recording a 4-0 win. In the bottom half of the draw Joshua Stacey came through a tougher encounter with 4th seed Ben Foss and won 4-1. Saturday was an action packed day where 6 events were contested. It also saw the crowning of our first 4 Island Champions of the season. Another first this year is that the finals of the Junior events are contested on the same day as the event and not during the annual finals night spectacle. The Under 11 title was therefore the first to be played through to conclusion and the first champion was crowned. Top seed Ben Sharp made his way to the final with straight game wins over Megan Simonet and 3rd seed Zaheer Anees. His opponent in the final was 2nd seed James Crocker after the 5th Division player battled past Henri Whitehorne 11-8 in the 7th and deciding end of a pulsating encounter. Sharp became the first champion after he emphatically beat Crocker in straight games. In yet another event to go the way of the seedings, top seed Corey Brouard reached the final where he met 2nd seed Callum Gilson. The former had a tough semi final encounter with 4th seed and Under 11 champion Ben Sharp to contend with and he toughed it out to win 4-2. Gilson on the other hand had a slightly easier clash with surprise package Freddie Walker and came through 4-1, with 3 ends edged 12-10. Walker had a good tournament and defeated seeded Alderney players Melissa Johns and Amy Wesley to reach the semi final stage. The final was a cracker and Gilson showed true fighting spirit to battle back from 3-1 down to force the decider. Brouard looked to have the title in the bag whilst holding 4 match points at 10-6, but Gilson fought hard to restore parity at 10-10. 2 more match points came and went for Brouard and Gilson incredibly clinched the crown on his first match point at 13-12 to secure the incredible comeback upset win. Alderney player Marli Barker contested the final of this event against fellow Ridunian Melissa Johns. Barker eased to the final with wins over Star O'Connor and Tia Timms, whereas Johns overcame 2nd seed Amy Wesley in a 6 game upset and other surprise package Erin Vaudin, also in 6 games. The final was another tense affair and it was the seeded Barker that held her nerve to win the 7th and deciding end 11-6. Top seed Ben Foss made his way to the final where he met 2nd seed Luke Bichard. Foss dropped an end during his 5 game quarter final win over Corey Brouard, but he was near his best during a straight game win over 4th seed Dan Collenette in the semi finals. Bichard had a tough semi final against 3rd seed Matthew Casey and needed to overturn a 2-0 deficit before coming through in 6. Foss dominated the final between the 2 players and won comfortably in straight games. Top seed Dawn Morgan will meet long time rival and 2nd seed Kay Chivers in the final next Saturday. Morgan beat juniors Charlotte Casey and Chloe Le Tissier in straight games during the quarter and semi finals respectively. Chivers also reached the final without dropping an end as she beat Amy Wesley and Sam Kershaw. Top seed Garry Dodd will meet 3rd seed Olly Langlois in the final. Dodd looked sharp throughout and he eased past Paul Hainsworth, Luke Bichard and Liam Robilliard to reach the semi finals where he met 7th seed Lawrence Stacey. Stacey himself had just put in a terrific display to overcome twin and 4th seed Joshua in the quarter finals. Lawrence trailed 2-0 and 3-2 but showed great spirit to come through 11-8 in the decider. Dodd looked in control of the semi throughout and despite dropping the 4th end, he came through 4-1. Langlois was in great form en route to the semi final stage and he beat Ryan Gilson, Ben Foote and 6th seed Phil Ogier in style without loss. 2nd seed and defending champion Joshua Butler was his opponent at the semi final stage after he navigated a tough draw. First up he overcame a tough opening match with Ben Foss in straight games before defeating Brian Ferbrache 4-0. Another tough match came in the quarter finals against 5th seed Alex Robinson, but Butler was more than up to the challenge and won 4-1. The semi final between Lions B team-mates Langlois and Butler was an edgy affair that went the distance. Langlois crucially opened up a gap in the 7th and never looked back, taking it 11-7 and ending the champions reign. Sunday's action kicked off with action from the Under 18 Mens and Womens Singles events. The final of this event was contested by top seed Chloe Le Tissier and 2nd seed Charlotte Casey. Le Tissier beat Marli Barker 4-1 to reach the final, whereas Casey beat Erin Vaudin in straight games. Le Tissier played high quality table tennis throughout the final and won in straight games. Top seed Ben Foss contested the final against 4th seed Matthew Casey. Foss was clinical during straight game wins over Ryan Wesley and 3rd seed Luke Bichard on his way to the final. Casey had a much harder route to the final and he needed 6 games to get past in form Ryan Gilson in the Quarter finals before he upset 2nd seed Ryan Bichard in the semi finals 4-1. Foss showed good form in the final and came through in straight games. Top seeds Ben Foss and Ryan Bichard reached the final which was contested against 2nd seeds Luke Bichard and Matthew Casey. Foss and Bichard eased into the final with straight game wins over Caden Brouard and Ben Sharp and then 3rd seeds Joseph Bourgaize and Stuart Sarre in the semi finals. Bichard and Casey also reached the final without dropping an end after overcoming Billy Ogier and Corey Brouard in the Quarter finals and then 4th seeds Ryan Gilson and Charlotte Casey in the semi finals. The top seeds Foss and Bichard slipped to a 2-0 deficit in the final but managed to battle through in 6 games, with 2 of their 4 ends crucially clinched 13-11 and 14-12. Top seed and defending champion Ian Fitchet reached the final and he will meet 2nd seed Maurice James in the final. Fitchet beat Rose Powell without loss in the quarters before coming through against Brian Le Cras over the course of 6 games in the semi finals. James had a very tough quarter final encounter with Peter Powell which he eventually came through in 6 games. His semi final was a lot more comfortable and he eased past Dave Finn 4-0 to set-up the final with Fitchet next Saturday evening. Top seeds Jez Powell and Phil Ogier will compete against 2nd seeds Martin Sarre and Dawn Morgan in the final. Ogier and Powell reached the final after they overcame 3rd seeds Kay Chivers and Keith Opie 4-1 in the semi finals. Sarre and Morgan also came through their semi final encounter in 5 games, their defeated opposition coming in the form of St Pauls 4th seeds Chas Elliott and Maurice James. The 4th day of action from the 2015/16 table tennis Island Championships saw the flagship Men's and Women's Doubles events contested. The number 2 seeds for the event, Garry Dodd and Paul Hainsworth will contest the final against the 3rd seeded pairing of Joshua Stacey and Lawrence Stacey in the final on Saturday evening. Dodd and Hainsworth defeated 4th seeds Phil Ogier and Jez Powell 4-2 in the semi final from the bottom half of the draw and this was the same result from the other semi final where the twins secured an excellent 6 game scalp of the top seeds for the event, Olly Langlois and Joshua Butler. The top seeded duo of Dawn Morgan and Kay Chivers will contest the final against the 2nd seeded junior combination of Chloe Le Tissier and Charlotte Casey. Morgan and Chivers came through against Sam Kershaw and Paula Le Ber without loss in the semi final.